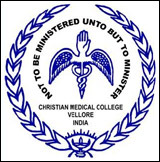 Christian Medical College, Vellore, Tamil Nadu conducts entrance examination test for admission to post-graduation diploma and degree medical courses. The institute has a campus in Vellore. It is one of the best medical colleges in India. From 2018, the CMC Vellore entrance test is being replaced by NEET and the admissions to the MBBS course will be done only through the NEET 2018 scores. Application Form Availability: In the Month of July 2018. NEET Exam Date: In the Month of July 2018. Last Date to Submit Application Forms: During August 2018. Issue Of Hall Tickets: In the month of August 2018. Results: In the Month of September 2018. Age Limit: The candidates must be 17 years old as on or before the 31st December of the year of examination to be eligible. Only unmarried women are eligible for the B.SC Nursing course. Candidates must have an aggregate of 45% in chemistry, physics, biology, English to be eligible for the course. NRI Students: Candidates who have qualified overseas, their equivalence of qualification will be done based on the guidelines of Association of Indian University. Their eligibility criteria is set by Dr MGR Medical University Chennai. These candidates must get in touch with Tamil Nadu Dr MGR Medical University Chennai for detail on their eligibility. Employed Candidates: Candidates who are already working in any government or private institutions are required to obtain ‘No Objection Certificate’ from the employer to be eligible. In any circumstances, if candidates are not able to submit NOC with CMC Vellore MBBS 2018 application form, they can submit NOC letter later with a covering note. If they fail to produce the NOC, they are not eligible. The candidate should have qualified in the Undergraduate NEET 2018 examination to be eligible. The admission to the Institute will be given based on the NEET score. The candidates must be 17 years old as on or before the 31st December of the year of examination to be eligible. Maximum age for candidates for the AHS course is 40 years. Candidates above 40 years of age are not eligible. Must have 60% marks at 10+2 level in each of Physics, Chemistry and Biology (or Botany and Zoology taken together) to be eligible. Must have an aggregate of 140/200 in these subjects both at qualifying and competitive examinations and must have passed in English subject to be eligible. Also, the candidate should have 55% in each and 120/200 aggregate for MBC; 60% in each and 130/200 aggregate for BC; and 40% in each and 80/200 aggregate for SC/ST candidates) to satisfy the eligibility criteria. Availability Of Application form: The filing of form begins from July 2018, you can log in to the official website (http://admissions.cmcvellore.ac.in) to proceed with the application. The process of online application will last from July 2018 to August 2018. Obtaining Application Form: Visit the official website and fill in your personal, academic and communication details.Choose your preferred exam centre. Complete details about your education.Check the information you entered once again and then click the Final Submit button. Uploading of images which include thumb impression, signature, and photographClick on upload photograph and browse your computer to upload a photograph. The photograph must be in JPEG format, should not be larger than 80 kb and its dimensions should be 3.5 cm x 4.5cm.Click on the blank area to upload signature and browse your computer. The signature should be in JPEG format, the file size should not be larger than 50 kb and its dimensions should be 3.5 cm x 1.5 cm. Mode of Payment: Payment of the fees through Debit Card/ Credit Card/ Challan or DD. Availabily of Application for MBBS 2018: The registration for this examination can be done online. You can apply through the official website of CMC. For applying to this exam the candidates should register themselves with official site and then go to the application form. There will be an only online mode for the application. Admit Card Issue: The admit card for the Candidates who have applied will be available in the Month of August 2018. Selection Results: The Selection Results will be available in the Month of September 2018. Availability of Admit Card: The Admit Card will be available on the website (http://admissions.cmcvellore.ac.in) in the month of August 2018. Obtaining Admit Card: Candidates will have to visit the official website for CMC VELLORE 2018, and by providing the required details for downloading the Admit Card. Admit Card to CMC Vellore 2018: The admit card is also used for verification. Candidates must ensure that the details mentioned on the admit card are correct, Any discrepancies found in the details mentioned in the admit card must be reported to the exam conducting authority immediately. Authentication of the admit card is necessary. The admit card must not be tampered with. If an admit card is found to be tampered with, the candidate can be barred from writing the exam. Plagiarising the admit card is a punishable offence. Mode of Exam: The Examination for CMC VELLORE 2018 is a computer-based examination. Duration of Exam: 03 hours and 10 minutes are allotted. Marks Alotted: A total of 300 marks are allotted for the Multiple Choice Questions. Marking Scheme: The candidate will be awarded one mark for a correct answer. There will be no deductions for incorrect answers. The questions in the examination are based on 10+2 level and include topics from Physics, Chemistry, and Biology. A brief overview of the topic is mentioned below. You can download the detailed syllabus from the official website (http://admissions.cmcvellore.ac.in). General Aptitude and Current Affairs. The results of CMC will be available in May 2018. After the results, the shortlisted candidates will have to appear for another test. The selection process involves an interview in the second stage. The results for the second stage of tests (special tests and interview) will come out in June 2018. How to Obtain CMC 2018 Results: The results can be checked from the official website with the use of their Application number.